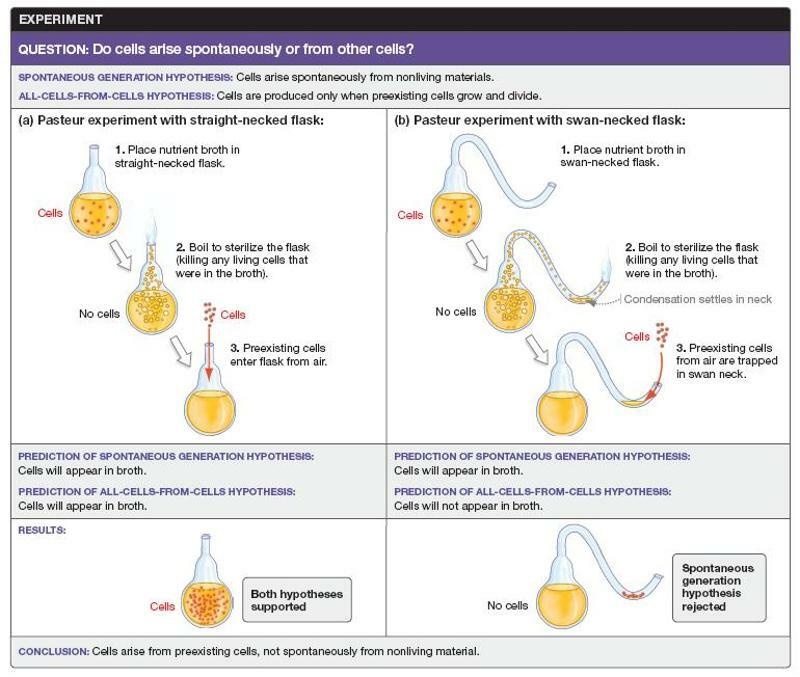 Pasteur's experiment provided conclusive evidence to reject the spontaneous generation hypothesis, which states that cells arise from nonliving material. As a consequence, his results supported the all-cells-from-cells hypothesis. Which element of Pasteur's experimental design was most important and why? *His two treatments differed only in the shape of the flask, resulting in exposure of only one of the treatments to preexisting cells. *His two treatments differed in both the type of nutrient broth and the shape of the flask, resulting in the exposure of only one of the treatments to preexisting cells. *His two treatments differed only in the type of nutrient broth used, resulting in the exposure of only one of the treatments to preexisting cells. *His two treatments differed in the shape of the flask, the type of nutrient broth, and the amount of time the broth was boiled, allowing him to test multiple factors. His two treatments differed only in the shape of the flask, resulting in exposure of only one of the treatments to preexisting cells. Because he was testing whether exposure to preexisting cells is required to produce new cells, it was essential that the only difference between treatments was the factor being tested. Which of the following statements is not true of scientific experiments? *They must be well documented. *They yield useful results regardless of whether the hypothesis is supported or rejected. *They must occur under carefully controlled conditions found in a laboratory. They must occur under carefully controlled conditions found in a laboratory. Not all experiments are performed under laboratory conditions; many occur outdoors in uncontrolled conditions. Scientists must account for these variations when designing experiments. In an experiment, investigators try to control all of the variables except one—the one that tests the hypothesis. Which of the following reasons is the primary rationale for controlling variables in an experiment? To eliminate alternative explanations for the results of an experiment. Controlling all variables but one ensures that some other factor is not responsible for the results obtained from an experiment. Which of the following statements could not be supported or rejected by a scientific experiment? *College students think football is more fun to watch than baseball. *Grass is green because it contains chlorophyll. The first living cell on Earth came from outer space. An experiment could not be designed to test this statement. Science neither supports nor rejects this idea. Which of the following statements is true of a hypothesis? *A hypothesis can be proved. *A hypothesis can be supported or rejected through experimentation. A hypothesis can be supported or rejected through experimentation. A hypothesis is supported or rejected based on the outcome of one or more experiments. Which of the following variables did Pasteur change in his experiment to test the hypothesis of spontaneous generation? By using a swan-necked flask for the experimental treatment, Pasteur ensured that no cells were entering the flask from the air. Thus, any organisms that appeared in the experimental flask would have arisen spontaneously. In Pasteur's experiment to test the hypothesis of spontaneous generation, why did he boil the broth in both flasks? Pasteur boiled the broth to kill any existing organisms, thus ensuring that the conditions in each flask were identical (i.e., lacking organisms) at the start of the experiment. What results from the Zonosemata experiment support the sub-hypothesis that wing waving alone reduces predation by jumping spiders? *Houseflies with Zonosemata wings are attacked less frequently. *Untreated Zonosemata flies are attacked less frequently. *Zonosemata flies with housefly wings are attacked less frequently. *Zonosemata flies with their own wings cut and reglued are attacked less frequently. Zonosemata flies with housefly wings are attacked less frequently. This experimental group tests the effects of wing waving alone. Suppose that Zonosemata flies whose own wings had been clipped and reattached were attacked more frequently than untreated Zonosemata flies. How would this result affect the reliability of the other experimental results? *The reliability of the experimental results would not change. *All results for the experimental groups using houseflies would be invalid. *All results for the experimental groups involving wing surgery would be invalid. *All results for the experimental groups using Zonosemata flies would be invalid. All results for the experimental groups involving wing surgery would be invalid. This result suggests that the presence or absence of wing surgery itself may affect the jumping spider's responses. Thus, there is not enough information to draw conclusions from the data because there is an alternative explanation for the results of the experiment. In the experiment on ant navigation summarized in Figure 1.9, what would you conclude if, in the first test, the normal individuals had not walked 10 meters on the return trip before looking for the nest? *Preventing ants from making their characteristic 180° turns when looking for the nest might have altered their behavior on the return trip. *Switching the ants to a new channel for the return trip might have altered their behavior. *Preventing ants from feeding at the end of their outbound trip from the nest might have altered their behavior on the return trip. *The manipulation used to create ants with stilts or stumps might have affected their behavior on the return trip. Switching the ants to a new channel for the return trip might have altered their behavior. 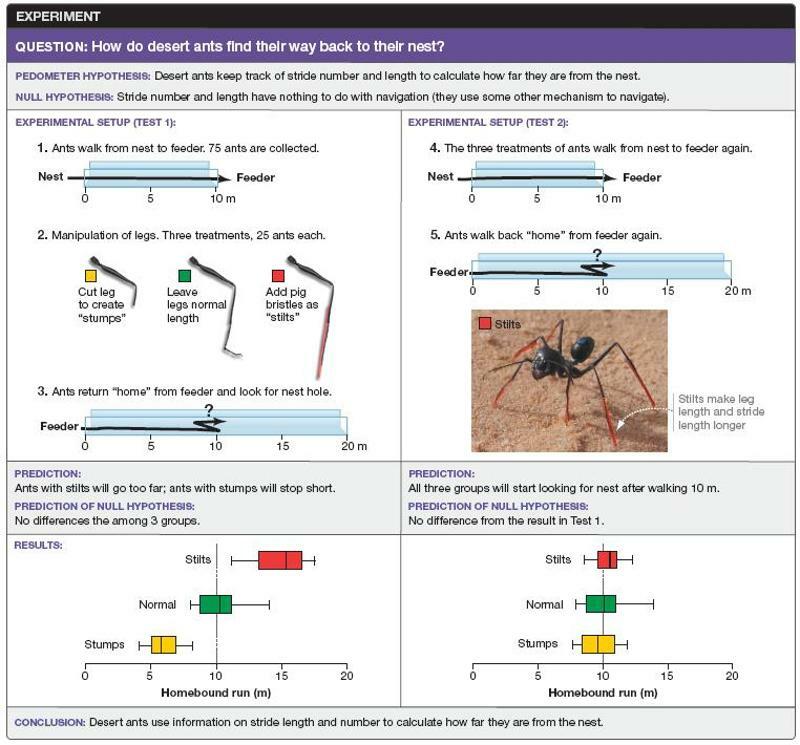 In this case, the results for stilts and stumps would also be called into question because these ants were also switched to a new channel. To answer questions about life, biologists use the scientific method, which involves hypotheses, predictions, and experiments. Which statement most accurately summarizes the relationship among these three elements? *A hypothesis is a proposed explanation for a broad pattern in nature; a prediction is a specific claim that follows from a hypothesis and that can be tested in an experiment. *A prediction is a proposed answer to a tightly focused question; a hypothesis is a specific claim that follows from a prediction and that can be tested in an experiment. *A hypothesis is a proposed answer that can be tested in an experiment; a prediction is a proposed answer that biologists use only when experiments are impossible. *A hypothesis is a proposed answer to a tightly focused question; a prediction is a specific claim that follows from a hypothesis and that can be tested in an experiment. A hypothesis is a proposed answer to a tightly focused question; a prediction is a specific claim that follows from a hypothesis and that can be tested in an experiment. What type of bond is joining the two hydrogen atoms? A(n) _____ refers to two or more atoms held together by covalent bonds. This atom can form up to _____ single covalent bond(s). A(n) _____ bond joins these two oxygen atoms. Which of the following statements most accurately describes the relative positions of the shared electrons in methane (CH4) and ammonia (NH3)? *Electrons are shared equally in both molecules. *Electrons are shared equally in CH4 and unequally in NH3. *Electrons are shared equally in NH3 and unequally in CH4. *Electrons are shared unequally in both molecules. Electrons are shared equally in CH4 and unequally in NH3. In a neutral solution the concentration of _____. How does the pH of the solution on the right compare with that of the solution on the left? *The solution on the right is basic relative to the solution on the left. *The solution on the right is acidic relative to the solution on the left. *The solution on the right is neutral relative to the solution on the left. *Both of these solutions are equally basic. *Both of these solutions are equally acidic. The solution on the right is basic relative to the solution on the left. Which statement best explains the physical basis for why oil (molecules containing only carbon and hydrogen) and water do not mix? *Oil molecules interact via hydrogen bonding more strongly with other oil molecules than with water molecules. *Oils are negatively charged molecules that are repelled by the partial negative charges on water molecules. *Oils are nonpolar molecules that cannot interact with water molecules via hydrogen bonding. *Oils are positively charged molecules that are repelled by the partial positive charges on water molecules. Oils are nonpolar molecules that cannot interact with water molecules via hydrogen bonding. 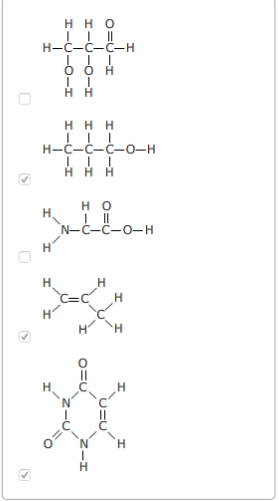 The hydrogen bonds among water molecules endow water with which property? *Solid water (ice) is denser than liquid water. *Water has a high specific heat. *Water is a good solvent for nonpolar molecules. It takes a lot of energy to raise the temperature of water. Temperature measures the movement of molecules and energy must first go into breaking the hydrogen bonds before the energy can allow increased movement. What type of energy is stored in the chemical bonds of a molecule? Potential energy is energy based on position. Chemical bonds will vary in the amount of chemical potential energy they have based on the location of their electrons. The first law of thermodynamics states that _____. The first law of thermodynamics states that energy is conserved—it cannot be created or destroyed, only transferred and transformed. Which molecules show an appropriate number of bonds around each carbon atom? Select the three that apply. Since carbon atoms are tetravalent (able to form four bonds), atoms may branch off a carbon atom in as many as four places. The ability of a carbon atom to form four different bonds allows carbon to form many different sizes and types of molecules. Carbon atoms may form chains, rings, or combinations of chains and rings. The tetravalence of carbon makes it particularly well-suited to forming the backbone of a huge diversity of organic molecules.